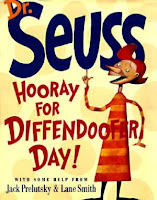 Muneera Allie: My favorite Cat in the Hat book is Hooray for Diffendoofer Day! 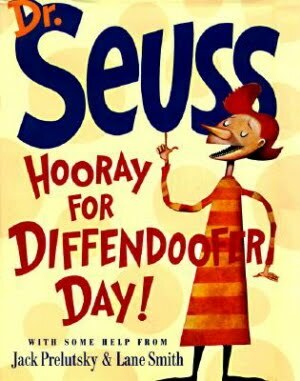 My favorite Cat in the Hat book is Hooray for Diffendoofer Day! …. because… it’s a celebration and encouragement for the out-of-the-box in us. Diffendoofer is a school in Dinkerville where the kids learn things not taught in usual schools. There’s no maths, languages or sciences, but subjects on listening, smelling, laughing, yelling- tying knots and distinguishing between a cactus and a cow. Miss Bonkers is a favourite and to kids it seems she teaches everything, fondly described as being “different-er than the rest”. Diffendoofer is a far cry from neighbouring Flobbertown, where everyone dresses in one style, sings one song and march in single file. In Flobbertown, even the dogs are afraid to bark. The celebration of Diffendoofer Day comes about when the school is in danger of closing down if they cannot prove kids are learning what they’re suppose to learn. With the kids all passing the special test and saving Diffendoofer from closing down, the headmaster declares a holiday to celebrate Diffendoofer Day. In Hooray for Diffendoofer Day we learn the value of and celebrate creative thinking and individuality. It paints and dull and boring picture of the mediocre and conforming to socially accepted standards. In this book we learn that contradictions, inconsistencies and paradoxes are perfectly acceptable… being different-er than the rest is more than perfectly OK.
We went to Dr. Seuss world when we were in Orlando - it was awesome- absolutely loved it!! Try remind me to send you some pics! OMGSH!!! There's a Dr Seuss World???!!! hmm something to add to my bucket list it seems :o) I will so remind u for pics!! !